Purple villa is lovely – the photos do not do it justice. Four of us booked the villa for 11 nights from late September to early October 2016. I booked the villa via tripadvisor but noted no review of this villa so was a little nervous to start with. My husband and I stayed with another couple that we have previously travelled to Bali with but stayed in a resort - this was by far better than a resort. The airport pick up was arranged and was included as part of our deal. Our flight was an hour late then the luggage took an hour to come out, so we wondered if the driver would still be waiting. There he was! Purple villa sits on a lane but is accessible from a road that is currently under construction – so when the driver took us on a dirt road that resembled something from the ghetto we all looked at each other in terror. Once we got into the lane and through the private secure gate we were pleasantly surprised. Iwan was there to meet us despite our very late hour arriving. The villa is very private and very secure. The bedrooms are all air-conditioned and have en-suits, and are all private which is perfect for 3 couples (or 2 in our case). 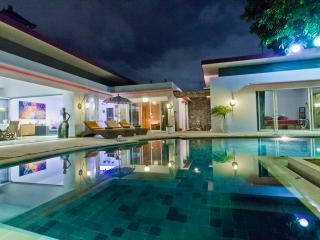 The villa is clean and has a number of home comforts including an excellent sound system to connect your music to. The main bedroom is separate from the main building and has a large en-suite which is partly outdoor, it also have an enormous bath with shower. Only hint is that being partly open, the bathroom can get very warm/humid where the wc is. Between the bedroom and bathroom, there is a lockable door (providing security if you worry when you go out) this keeps the bedroom area cool when the air-conditioner is on. The bedroom and robe are huge, there is a safe in this room and TV with DVD player. The second room is attached to the main building and has a lovely step-down bath with shower, this bathroom is also partly open. We found 2 of the resident frogs enjoying the privacy of the bathroom also. This room has air-conditioning and TV. The third room is totally separate and has a shower but no bath. There is a safe in this room with a large robe and a much cooler wc. The pool is a great size with a deep end but the majority is one level which is brilliant. We purchased a couple of pool air mattresses which made our pool time enjoyable (so pack something like this with you or buy there – we paid AUD$10 in Bali). Pool towels are provided also. The kitchen is well stocked and fresh water was supplied. The water cooler also provides hot water for your coffee/tea. There is a fridge/freezer and ice cube trays. We went to the supermarket at the Matahari in Kuta and the Bintang supermarket in Seminyak. Kuta grocery prices are cheaper. There is a large TV with music centre, we plugged both Samsung and i-phone into this. There is a couch and bar stools at the kitchen bench. The outdoor area has a table and cane lounge plus there are several bean bags. Iwan the caretaker is very helpful and cleaned the villa every day perfectly. He is careful not to intrude on your privacy which is thoughtful. Iwan lives near the villa so is easily contactable. 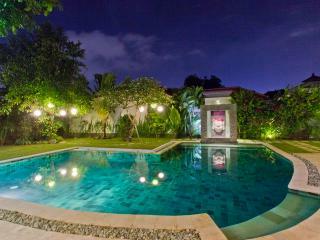 Purple villa is just a few minutes’ walk to the main streets of Legian or to get a taxi but it is quiet and in a secure environment with several locked gates. The location is actually ideal. Each bedroom has separate keys and can be securely locked so can the villa entrance and gate to the area. We took a power board and used this with one plug converter – this was excellent for our charging needs. We had a couple of very minor mix-ups which were sorted and fixed, Hugo the Manager was very helpful and attentive. We didn’t have mobile access but would consider this for next visit. The villa does have Wi-Fi which is reliable and fast. In all this villa is excellent and I would highly recommend it.